Jesus is the most popular person in history. Now, He’s not the most liked, but His name is known throughout centuries and across countries & continents. In today’s world he has gone “viral”. But, being known but not necessarily accepted throughout history has created various perspectives about Jesus. The questions linger: Who was He? What was His purpose? Why is His death celebrated and how does His life relate to our own? In 2012 @SPBC we are seeking to know Jesus; not just about Him in facts and figures but know His life and accept Him through faith. In our study of Luke’s Gospel, we see Jesus’ ministry focused on perfectly revealing God and profoundly loving people. He loved people by teaching crowds, healing sick & diseased, feeding the hungry, comforting the brokenhearted and loving sinners. Yet, Jesus’ mission and life purpose went further than social support to salvation significance. Jesus was sent to die on a cross for the forgiveness of sin and acceptance to eternal life with God. The cross stands as the most significant symbol for the identity of Jesus and His followers – we must understand the message of the cross. The Bible gives only brief detail to what crucifixion means. Crucifixion was the most painful mode of execution reserved for the most despised criminals. Jews viewed crucifixion as being under God’s curse. The ancient Roman philosopher Cicero asked that decent Roman citizens not even speak of the cross because it was too disgraceful a subject for the ears of decent people. The agony of crucifixion is due to the fact of its prolonged means of death. Those crucified would often hang on a cross for days, passing in and out of consciousness as their lungs struggled to breathe, while laboring under the weight of their dying body. 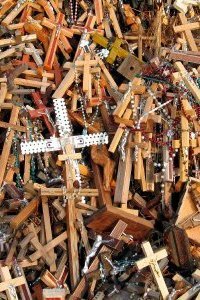 Due to the fact that timber was so expensive, the wood of the cross was typically recycled wood, therefore layered with the blood and sweat of many others. The crucifixion process was started with the victim being stripped naked, humiliated and then attached his hands and feet across a wooden beam to expose the victim’s bare back. A Lictor, a professional executioner, would yield a cat-o’-nine tails, which was a whip with tentacle-like straps having heavy scraps of metal, bone and glass attached to the end of the straps. The intention of the Lictor was to tenderize the flesh of the shoulders, backs, buttocks and legs of the victim. As skin, muscle, tendons and even bones were ripped off the victim some would die from this scourging itself. After this scourging, there was placed on Jesus head crown of thorns. Long thorns that would pierce into his forehead,ears, brow and even skull. All of this was done publicly, thereby bringing utter shame and making an utter spectacle of the victim. Sweaty, sun-baked, nailed naked to a cross, bloodied and body fluids oozing was an atrocious sight. The crowds gathering around this sight today would be like viewing an execution in front of a local mall. Females were mostly withheld from this form of execution but when such they were turned to face the cross so the public did not have to view a woman’s facial expressions, as it was harsher to see females suffer. In fact, today we have the painful word – excruciating – which literally means “from the cross”. On this cross, nails/spikes were driven into Jesus’ hands and feet – the most sensitive nerve centers on the human body. He was then lifted up as the cross was placed into a pre-dug hole. Further mockery would take place as the crowd hurled insults and spat into his face. As all this is rather dreary, the question arises, What was the purpose of the cross? 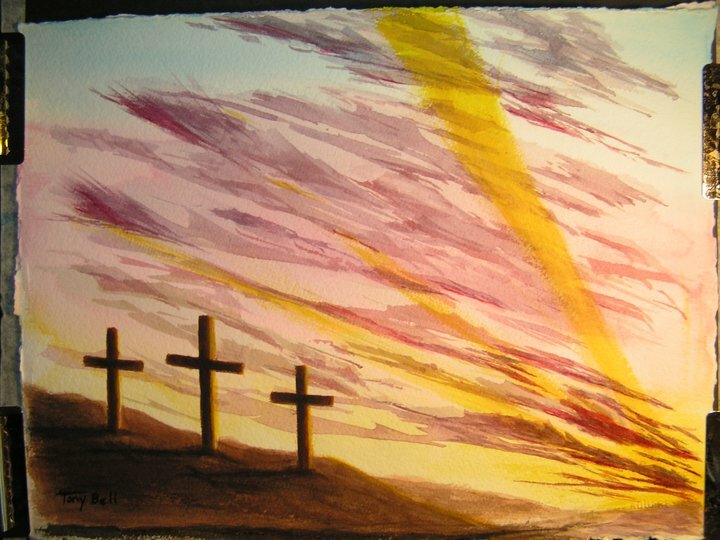 How can Christians celebrate the cross of Jesus as good news? Jesus had spent much time with the disciples. They saw He did many miracles and had divine power/authority. The time had come for the disciples to personalize their faith. It would be a defining point in each of their lives. Jesus asked, “Who do the crowds say that I am?” Then he asked, “But who do YOU say that I am?” The “you” is emphatic to note that faith in Jesus is not just that passing on of learned information but is personal faith and trust. Peter’s response was that Jesus was “The Christ of God”. In other words, Peter and the disciples believed that Jesus was the expected Messiah – the One promised to be sent by God, who would beIsrael’s protector, restorer and redeemer. In their eyes, the long awaited Messiah and king ofIsraelhad come and they were ready to become His revolutionary warriors to overthrow evilRome. No doubt, the disciples hearts pounded inside their chest with a nervous readiness for what Jesus would say next. Jesus’ follow-up was strangely for the disciples to tell this to no one. He went further to state His Messianic mission: must suffer many things, be rejected, be killed and on the third day be raised. In fact, this divine necessity to suffer would be repeated several times in Luke’s Gospel: 13:33; 17:25; 22:37; 24:7; 24:26; 24:44. Later, the disciples would similarly emphasize Jesus’ mission (Acts 2:23; 4:28; 13:32-33; 17:3). All this to say that the disciples’ perspective of the Messiah was incorrect. In His first coming, Jesus would not be a military warrior but a suffering servant. ð God’s purpose and mission was you. He loves you. He came to serve as your substitute – in life for perfection and in death for punishment. Jesus had a laser-focused mission to go toJerusalem and die on the cross for sin (Luke 9:51). We believe God’s purpose/mission is us but on our own terms.We want God to forgive our sin without death on the cross. We want eternal life, victory over our enemies without dealing with sin. Resurrection Sunday doesn’t come without Good Friday. Therefore, we must remind ourselves that God’s purposes are higher and better than human plans. Yield your plans to God’s purposes. Jesus further challenges the disciples’ view of His Messiahship and their discipleship with the following requirements: 1) Denial of self; 2) Take up cross daily; 3) Follow Jesus by losing life in this world for His sake. Further in Luke 9:57-62, Jesus said that the cost of following Him would be without refuge (no place to lay head); without rival (leave father) and without retreat (no looking back). The point was that discipleship is devotion and unrivaled commitment. Taking up a cross meant death. The additional statements were not definitive for every person – but simply put that Jesus knows each person’s heart idol; the God-substitute in our life where we place our affection and focus rather than in Him. You see, Jesus had plenty of crowd fans – those who sought Him for miracles and used Him as a means to personal happiness. But Jesus is not a means to a personal end – He is the end! Following Jesus and being with Him brings salvation, joy and satisfaction. ð Illustration: Have you heard about Emperor Penguins? Male and female penguins mate and reproduce under extreme conditions. Male penguin cares for the egg for the two months, goes without eating and typically loses about 40 pounds in process (from 80 to 40lbs). This is commitment. Jesus is looking for “emperor penguin” unselfish type disciples. ð Following Jesus calls for an evaluation of which kingdom are you living for – this one or the next? Jesus’ journey is your journey – to death and resurrection. Have you died to self? Jesus says there will be a defining difference for those who follow and those who do not. There would be some who choose to live for themselves and gain the world’s kingdom. Jesus uses the word “gain (kerdh>sav)” which is a merchants word showing profit and loss. Their gain would be short-lived in this life only and they would lose out on God’s kingdom. Jesus uses the word “lose (ajpole>sav)” a word used for 1) loss of life quality – a city, property or possessions, being utterly demoralized OR 2) loss of life totally to death. The loss would be both quantitative and qualitative. Further, Jesus uses the word “shame (ejpaiscunqh)” which implies feeling of disgrace and incurring dishonor from others or even humiliation in the eyes of others or guests (cf. Luke 14:9 or Hebrews 12:2 public disgrace). The idea is that persons will feel great grief and sorrow before God and His messengers. Those that live for this world gain in miniscule accounts and yet lose enormously, experiencing the shame of hell and missing the glory of heaven. Next week we will talk about the attraction of glory and how followers of Jesus receive glory through the power of the resurrection. So, in taking of the bread, we are reminded the cross of Jesus provides our forgiveness. So, in taking of these elements, we are reminded we proclaim Christ’s forgiveness not only to ourselves but are witnesses to others. Much of the following information on crucifixion comes from Driscoll’s Death by Love pp 17-34, and sermon “The Cross: God Dies”, along with John Stott’s The Cross of Christ.